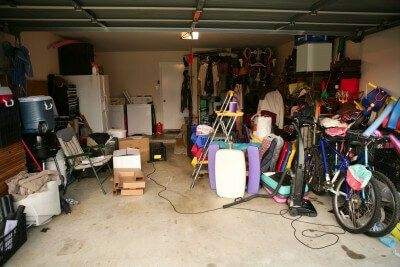 For most of us, the garage is likely the largest room in our house. Our cars are probably our second largest assets. It makes sense to use this space to house and protect our vehicles. During spring and summer, however, we leave our cars on the driveway to have easy access to things like lawn mowers, bicycles and gardening tools. It’s during the first cold snap of the year as we’re putting everything away that we look into our garages and wonder how two cars are going to fit. Seeing everything that’s filling up the garage, we experience paralysis. Often, there’s no clear way to start the clean-up process, so it doesn’t get started at all. I call this Seasonal Garage Anxiety Disorder (SGAD): All the stuff is preventing us from using our garages for what they’re meant for and it causes concern. In the next two blog entries, I’m going to help you cope with your SGAD! But first, we have to think about motivation: how badly do you want to get your car in that garage and why? One of the main objections to cleaning out a garage is the amount of decision making that has to happen. It requires some tough choices about what to keep and it’s usually a full day’s worth of work. I’ve encountered garages that were full of furniture – both from parents who have downsized and children who were moving out, seasonal decorations, winter tires, garbage and recycling bins. Some of the clutter has value, but there is only an emotional attachment to the rest. The feeling of relief that’s experienced once all the stuff you’re not using is gone, will give a sense of release and freedom necessary to move forward with new activities and projects. How great would it be to have shelving and storage systems that allowed garden tools, holiday decorations and toys to be found without digging through boxes? Easy access and storage for seasonal items like paddles, kayaks and canoes and tires? A discreet space for your garbage bins? Garage storage systems, whether it’s cabinets, wall organizers, shelving, or a combination, can keep the garage organized all year round. So when next fall comes, we’re not standing in front of our garage doors, wondering where we’re going to park our cars, we simply drive them in. Stay tuned for the next blog: How to get Started.